Jess did a pretty good job of making the cake from memory (I found the picture after she made it). 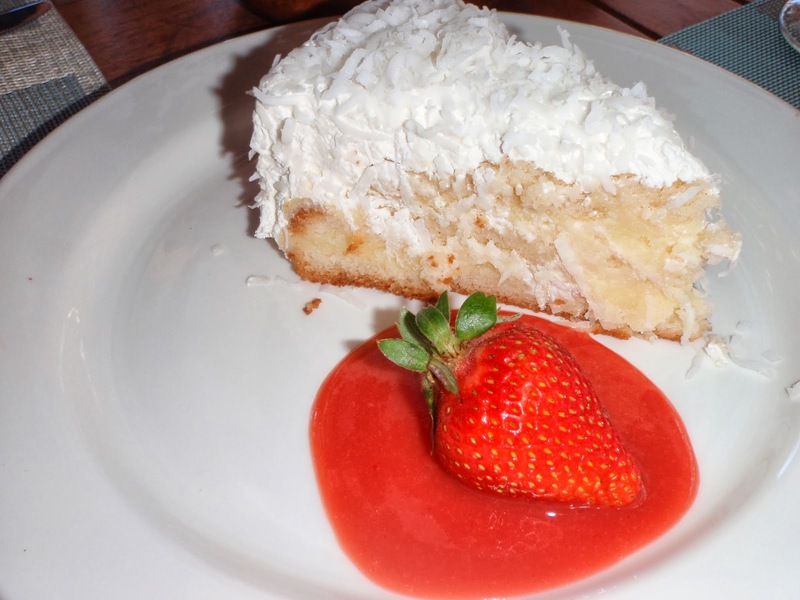 We both remembered how light the cake was and how creamy the coconut filling was. We didn't realize that the there was only a little strawberry sauce, I guess our memories did a good job of enhancing what we liked. Not having a recipe she turned to the internet for help. She found a Coconut Cake recipe on Paula Deen's website and figured it was close to wheat we had. I turns out Paula's recipe was drier and not a white as the Maui cake. The icing and filling was awesome but I think we will find a different cake recipe next time. I really struggle with simple things in the kitchen. I regularly need Jess to come pour, stir, or flip things because I have no finesse. Any time I make eggs I prefer my yolks to be soft so that you get the perfect ooze when you cut into them. I have been trying to nail down how to poach an egg for a while now and think I finally have a technique that works. Fill a large non-stick pan with 2 to 3 inches of water. Bring the water to a "near boil" (It should basically have bubbles all over the bottom of the pan). Crack an egg into a small bowl or the end of a ladle. Gently lower the egg into the water (repeat with however many eggs you want to eat). After a couple minutes use a slotted spoon to push the whites closer to the yolks. After 4 or five minutes use the slotted spoon to take the eggs out of the water and let them drain on a paper towel (the whites should look firm and no longer cloudy and runny). Use a little salt, pepper and paprika on the egg. Both have awesome breakfast/brunch menus. One of my favourite items was their "Moorish Eggs". It is basically meatballs in a tomato sauce with eggs poached in the sauce. It is usually served with toasted Turkish bread but I could only find Naan at the grocery store. I went really "Kiwi" and used New Zealand lamb for my meatballs. It ended up being good but a little on the sweet side for Jess and my tastes. I think next time I will make beef meatballs and go for a saltier tomato sauce and actually dig up some Turkish bread. Place half the onion, cumin, salt, pepper and coriander in a food processor and pulse until pureed. In a medium mixing bowl mix the onion mixture, meat, egg and bread crumbs. Roll your balls into the desired shape. Heat the oil in a frying pan and cook meatballs until cooked through. Chop the rest of the onion and saute it in the meatball grease. Add tomatoes and allow to boil, then simmer for 5 minutes. Dump the sauce into oven safe dishes and add the meatballs. Break as many eggs into each dish and bake until whites are cooked through. Jess was at Costco a couple weeks ago and came across most amazing snack food: "Chicago Mix" or "Chicago Style" popcorn... I can't remember exactly because things got blurry after the bag was opened and the food lust took over. This is the ultimate salty/sweet combo mixing caramel and cheddar popcorn. I have never been to Chicago but it is definitely on my list of culinary destinations. This popcorn is not something you can whip together before a movie but it is worth the effort and it makes enough to have it kickin around for couple days. There is the perfect balance between the two types of popcorn without feeling like you need to visit the dentist from the sweet caramel and like your heart is going to explode form the salt. I made the caramel corn first because it is more time consuming. Line a couple baking sheets with some parchment paper. In a large pot with a lid add the 3 tbsp oil and 4 or 5 kernels. Turn you stove on high and wait for the kernels to start popping. Add the rest of the kernels and shake. Try to keep the lid a little askew so that the moisture can escape and you will have nice fluffy popcorn. Keep it moving until it sounds like the the popcorn is done. Separate any un-popped kernels and spread the popcorn out on the parchment paper. In a medium saucepan (preferably non-stick) melt the butter. Bring it to a boil and stir constantly. Take the pan off the heat and stir in the soda and vanilla (it will bubble up and look like a science project; this is normal). Drizzle over the popcorn and stir. Put it in the oven and stir every 15 mins for 1 hour. Remove from oven and let cool then break into pieces. Pop the corn as above and separate the un-popped kernels. While it is hot add the melted butter the sprinkle the spices over top and toss. Mix the two together and enjoy! On her last trip she found a recipe for homemade Reese Bars. I guess Karma punished her for being a blog cheater because her bars turned out to be impossible to get out of the dish intact. The only thing we could think of was to bust it up and make ice cream. Despite the unbelievably cold weather here we have both bundled up enough to eat a couple bowls of this and it may be the best ice cream we've made yet! It tastes like a Reese Peanut Butter Cup or a Butterfinger. Pour one cup of the cream into a sauce pan. Heat on medium heat until the sugar is dissolved (it will look almost clear). Remove from the heat and add the vanilla extract and remaining cream. Churn the mixture for ten or 15 mins. Move it out of the ice cream maker and mix in the Reese Bars. Jess was working late tonight so I decided to make her a treat for when she got home. I was going to make her some of her Nonna's bread but it is a pretty big recipe. I have been craving coconut filled Chinese Cocktail Buns for a while and we had a bag of coconut in the cupboard so I went for it. My dad used to bring cocktail buns home when we were growing up and I remember devouring them as quickly as I could. We don't live too far from China Town and I would have no problem picking these up cheap but I never seem to carry cash and all the good places only take cash. These turned out way better than I could have hoped. They looked and tasted like the real deal and nothing can replace how great something is fresh out of the oven. If you cut a bit of the sugar out of the dough recipe I think you would have and awesome burger or hot dog buns. I made six buns between 6pm and 9pm. Activate the yeast in a medium bowl by mixing the warm water, sugar, and yeast (set aside for 10 mins). In a stand mixer or large bowl mix the sugar, salt and oil. Add the boiling water and stir until the sugar dissolved. Add 2 cups of the flour, the yeast mixture and the egg. Start mixing with the dough hook and slowly add more flour until a dough ball forms. Knead for around 10 min. Set aside in a greased bowl, covered with plastic wrap and a tea towel, until it doubles in size (1 hour). In a food processor blend the coconut and sugar until fine. In a small bowl mix the coconut/sugar, yolk and melted butter. Punch down the dough and divide into 6 pieces. Stretch and pat out the dough into ovals large enough to hold a large spoon of the filling. Fill the dough and pinch it together to seal. Put the filled buns seam side down on a parchment covered baking pan. Mix the egg whites with 1 tbsp water. Brush the buns with egg wash.
Bake at 350 degrees F for 15 min. Broil on low for a couple minutes until they are a nice brown color. Mix the honey and other tbsp of water. Brush the warm buns (outside of the oven). I am going to be heading to New Orleans for a Stag at the end of March. In between the partying I am hoping to get some good meals in and try foods that I haven't eaten before. This was a quick way to use a potato, I've had sitting around for the month or so, and use some Cajun spices to get in the Southern mood. I ended up with nearly perfect "shoestring" fries that had just enough crunch on the outside while being soft and fluffy on the inside. Cut the potato into desired strips. Soak the chopped potato in cold water for around 20 mins. In a small bowl mix the seasoning together (it would be good as a rub on fish, chicken, pork or anything else). Drain the potato and dry with paper towel (make sure it is is as dry as possible, if you put something that is too wet into a fryer it pretty much explodes). Fry the potatoes at 375 degrees F for 5 mins then season immediately out of the fryer.